The ACT iAwards were held at QT Canberra on Wednesday 31 May 2017. 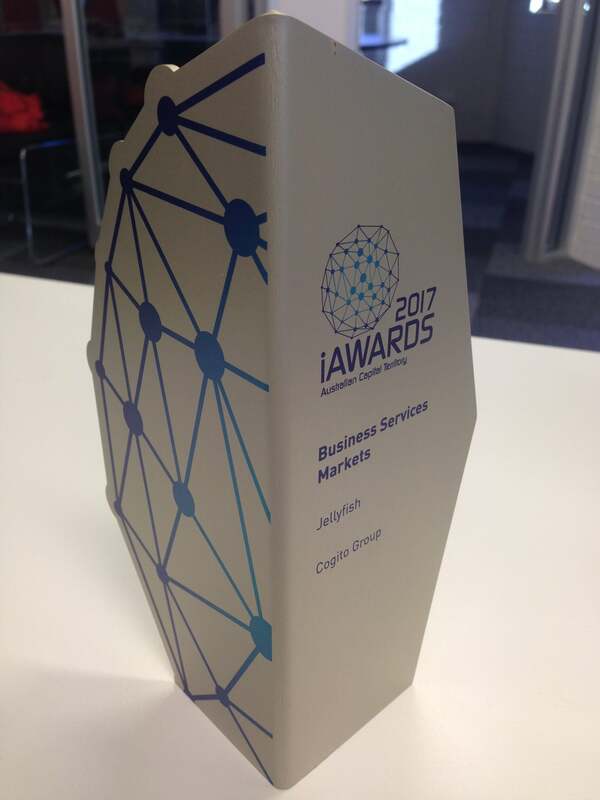 The AIIA’s iAwards honours both companies at the cutting edge of technology innovation as well as leading professionals across the Digital Economy. Most importantly, the iAwards recognises the achievements of home-grown Australian innovators. Cogito Group were proud to be finalists at these awards with our product Jellyfish. During the night we heard from Andrew Barr, Chief Minister of the Australian Capital Territory. Mr Barr was celebrating innovation and explaining the digital first transformation approach for the ACT. Cogito Group were honoured to be the recipient of a Merit award for Infrastructure & Platforms Innovation of the Year. We were also privileged to share the award for the Business Services market with SponServe. Winners and merit recipients across all categories progress to represent the Australian Capital Territory at the National iAwards in Melbourne. National winners will be announced on 30 August 2017 at the prestigious AIIA Gala Dinner and Awards Ceremony. Thank you to Australian Information Industry Association for providing a great platform for Australian innovators to be recognised.